Power Distribution Products provide an extensive line of power management products and technology that deliver safe and efficient power distribution to all applications. Ranging from the innovative features of eConnect Power Distribution Units (PDUs), Click Secure Locking Outlets and Secure Array IP Consolidation, to basic Power Strips and In-Line Meters, each power distribution products are specifically designed with flexibility and scalability in mind. eConnect PDUs are advanced, intelligent PDUs with high ambient temperature ratings, optional Click Secure Locking Outlets to prevent accidental disconnections and Secure Array IP Consolidation to group up to 32 PDUs under one IP address. eConnect PDUs provide detailed monitoring and control down to the outlet level. They are available in vertical and horizontal configurations and are ideal for use in today’s high-density data centers. Power Wedge PDUs are high outlet density 1U/2U horizontal intelligent PDUs for tight spaces. PDUs provide small to medium density power distribution with optional local meter. They are available in vertical and 1U horizontal configurations. Power Strips offer basic, dependable low-density power distribution with optional surge protection and local metering capabilities. They are available in vertical and horizontal configurations. Monitoring software turns the data collected by eConnect PDUs or other intelligent PDUs into actionable information. Users can build custom dashboards that show power and environmental trends, monitor capacity and alarms, create reports that document usage and cost and group and control devices across racks, rows and sites. 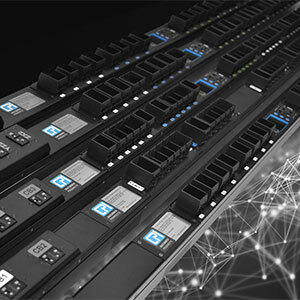 capabilities, specialized brackets mount PDUs in racks and cabinets and unique input power cords are available for eConnect PDUs. State-of-the-art single phase UPS products from GE Critical Power provide battery backup and equipment protection from any fluctuation in your power source for all business-critical applications. UPS products provide critical power protection for small to mid-size server, data storage, networking, telecom, point of sales and office applications. Four single-phase UPS models are available based on level of protection, power availability and type of installation. Use PowerScope In-Line Meter to upgrade your basic PDU for real-time power monitoring.When you upgrade a basic and locally metered PDUs with an in-line current meter, you will enjoy real-time power monitoring, which is essential to improving power usage effectiveness (PUE) in your data centers and equipment rooms. Additionally, it will help identify power problems, and track power demand, allowing you to organize IT processes and equipment for the most efficient use of available power. Power Distribution Products are designed to fully integrate into a Rack or Cabinet and Enclosure System to support a wide array of active equipment, and provide safe, efficient distribution of power.